Civ? Me and Civ? Yeah, we go a long way back. I still recall the day, just prior to my career in gaming actually, when I stood in the store torn. Should I buy Quake? Or Sid Meier’s Civilization II. The one with the monsters and visceral thrills? Or the one with the pedigree, the elephant on the cover, and the one that looked fiercely, defiantly, and wonderfully beautiful and complex. I came home with both, I’m proud to say. 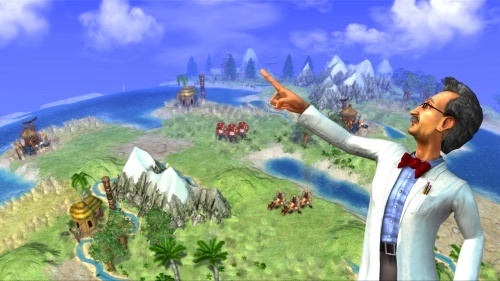 Civilization, the series, are the most ambitious playable games ever made. Each is a work of art in its own way (Civilization III was a stumble), and each can be played with a mix of wonder and bewilderment by casuals and newbies, or pored over and savored by studious types fascinated by all the choices and all their impacts. The game is surprisingly simple, but filled with wonderful technologies, moments, and personality. In the best of them the AI seems alive at times, and even in the worst, there’s always a reason to stay awake for a few more hours – just to see what happens. In an interview Sid Meier once told me: “I think a great game is just a series of meaningful choices, over and over again” and the result of that simple recipe is a powerful and contemplative gaming experience. One I recommend to intelligent moms, dads, and teens everywhere. But who has time for all that? And what about the people who are fascinated with history and the concept, but aren’t interested in a poster sized tech tree and countless unit, food, production, cash, science and birth rate, etc., simulation? Can Civ be boiled down to TV and even pocket sized? The answer, in both cases, is yes . . . but I spent most of my time with the Xbox 360 version. The game continues IV’s descent into cartoonishness with intrusive advisors and world leaders constantly appearing and speaking in that annoying Sim-English thing Sid and co. developed for Sid Meier’s Pirates (parents, buy that game). They can be silenced, but not removed entirely. They are welcoming and my kids think they’re awesome – actually, you know what they are really? They’re that MS Word paperclip in costume and acting all crazy. The graphics are lush, colorful and soothing and the music is so true to the series, you’ll hear most of those tunes here. The game still revolves around production, trade, and food but these are mostly on automatic. You can place workers, but you don’t do much by hand. This leaves you time to develop your army because, like Civ4, you’ll need it here. Oh and to anyone still annoyed that the early 90s Civ would allow a Phalanx to beat up a Tank on occasion? Well, with the experience point system they use here, you’ll see that sort of thing happen a lot. If the complexity of modern Civ is what excites you, go ahead and skip this game. But for those who realize/remember that Civ is at its heart of hearts a boardgame, you’ll quickly see that these ommissions, these compromises, still equal riveting gameplay – especially in multiplayer (and yes, the DS version is a fair facsimile). Kid Factor: It’s rated E-10 but aside from the scantily clad Cleopatra and the Cameron Diaz-esque Catharine of Russia (all the ladies in fact) and the semi-violence of the very cartoonish combat, there’s nothing here meriting 10 but the difficulty. It’s Civ-streamlined, but still not simplistic. Got it today for my slightly early and completely unofficial birthday. Haven’t played it yet but I hope it’s ok for people generally cr*p at Simulation games. I rarely got past half an hour (real time) on Sim City 2000 (or 3000, I’m not entirely sure what the number was) without going bankrupt. It isn’t so much of a simulation as it is Turn-based Strategy. It is funny you put this up … I’m in the middle of an article talking about the games that dominated our vacation, and this was one. I am rather split in my feelings about the game, but that is based on my love of the PC version. As a stand-alone I really like it and share the recommendation. Civilization simulates mankind’s noble and relentless stumble toward … civilization… through the pitfalls and travails of history. It does so in a turn-based fashion. You know where you can stuff your genres Mike? 😉 Feel free to write up the DS version, ‘specially if your kids played it at all. Some Guy, I can’t think of a more recommendable game for beginning to intermediate empire builders. I have the DS game, but my 7-yr-old son wasn’t that interested in playing it. His father, on the other hand… I really appreciated the pared-down gameplay offered on the DS. It was easy to get in to, and easy to save/quit when my kids needed me for something (the three-dimensional world comes first… I guess…) My husband didn’t like it so much at first- he’s a huge fame of the PC version- but has since come to appreciate the game for what it is- more portable than the laptop! I didn’t really get this one for the kids, anyway. This one was for Momma’s DS! I would think it is more geared to an older child, say, 10 or so. Hehe … GamerDad, as I read Some Guy’s fears I was just thinking of things I’ve done recently like Tycoon City New York (http://www.gamerdad.com/detail.cfm?itemID=3217) compared to Civ IV. I wasn’t dropping genres for any reason other to make sure he wasn’t scared off of this game. My analogy would replace your D&D with “Baldur’s Gate: Dark Alliance :: Baldur’s Gate 2”, because of the impact of what was removed upon potential avenues of gameplay. And Game-loving Momma – all I know is that my kids absolutely loved the game! And GamerDad, you can be sure I will! I’ll probably chime in with a 2nd opinion on the DS version as well (didn’t get the 360 version). I enjoy it as it’s Civ come to a handheld, the streamlining there isn’t as unexpected since it is a handheld, after all. I don’t mind the “action-y” console modifications to things (units with experience? sounds “festive”… chatty AI leaders? no problem) but there are some fundamental user interface choices that were simply left out and make the game far more fiddly than it needed to be.